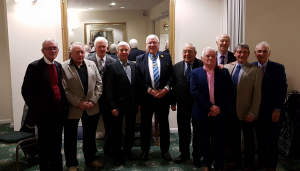 Annual Dinner – Radyr Golf Club – 5th January 2019. Following a superb dinner provided by the club catering staff, Long Service Awards were presented by our honoured guests, Dennis Gethin, Choir President, Owen Smith MP, Cllr. Steve Powderhill, Mayor of Rhondda Cynon Taff County Borough Council and Cllr. Linda Davies, Mayor of Pontypridd Town Council. David Couchman – Top Tenor, Renato Marenghi – Second Tenor, John Mathews – First Base, Brian Watts – Second Tenor, (Dennis Gethin – President) Roger Vaughan – Bottom Base, Gareth Morgan – Top Tenor, Colin Gregory – Second Tenor, Glyn Davies – Top Tenor, Jim James – Top Tenor. Personal data is information relating to a living individual who can be identified from that data. Identification can be by the information alone, or together with that data and other associated information, which is in the possession of, or likely to come into the possession of the ‘Data Controller’. In the UK, the processing of personal data is governed by the General Data Protection Regulation, also known as the GDPR. Côr Meibion Pontypridd (contact details below) is what is known as the ‘Data Controller’ of the personal data you provide to us. This means it determines how your personal data is processed and for what purposes. To keep contact with you as a member of the choir. To communicate with individuals who are carrying out specific roles. To track payments, Gift Aid, and mark birthdays and long service with the choir. To organise choir trips and events and information in relation to travel, accommodation and meals. To provide attractive publicity and practice environment by using photos on the website and in the rehearsal room. Processing your personal data in a lawful, fair and transparent manner. Collecting only personal data which is adequate and relevant to the purposes we have specified in this notice. Not keeping your personal data longer than necessary for the purposes we have specified in this notice. Ensuring your personal data is accurate and up-to-date. Implementing appropriate technical and organisational measures to protect your personal data against unauthorised or unlawful processing, accidental loss, damage or destruction. Where did we obtain your personal data from? The personal data we have comes directly to us from you or a family member who is a member of the choir. All your personal data is treated as strictly confidential and mainly processed by officers of the choir. For the purposes of administration your details may be kept on the computers of officers, which are within the UK. No third parties have access to your personal data unless the law allows them to do so. Partners in putting on choir events or trips. Venues which we have booked for accommodation or meals. We keep your personal data for 2 years from your last active involvement with the choir or until Gift Aid claims have been processed. If we wish to use your personal data for a new purpose, not covered by this Data Privacy Notice, then we will provide you with a new notice explaining this new use prior to commencing the processing. We do not knowingly transfer your personal data outside of the UK. Request to access a copy of your personal data, which we hold about you. Request to rectify your personal data if you find it to be inaccurate or out of date. Request to have your personal data erased where it is no longer necessary for us to retain such data. Request to have a restriction placed on further processing of your personal data when there is a dispute in relation to the accuracy or processing of your personal data. Request to obtain a copy of your personal data in a common machine-readable format and transmit that data directly to another organisation. Withdraw consent to the processing of your personal data at any time.